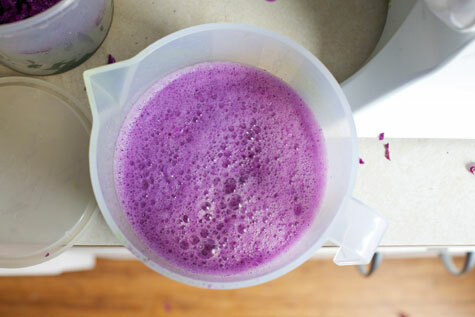 This red cabbage-cucumber juice is not a mistake. Love this stuff! I’ve been writing a lot about my love affair with green juice lately, and I’ve been thrilled to hear that many of you share my passion. I’ve also heard from a lot of people who want to try, or have tried in the past, to get into juicing. There seems to be a series of common roadblocks that stand squarely between a person and their glass of fresh pressed juice – I should know, because I have experienced them myself! Here I outline the five most frequent errors people make – and of course, how to remedy them. 1) Too Much Sweet / Not Enough Green: Fresh Juice is incredible because the nutrients are parted from the bulk that binds them. This means the goods are instantly absorbed into the bloodstream, offering a hefty load of vitamins and minerals. BUT, it also means that sugar is on the loose as well. Thus, those folks (like me) who are sensitive to glycemic fluctuations, need to make sure that their juice doesn’t pack a sugar punch. When I first started juicing I would toss in apples, oranges, carrots, and finally a few greens. I’d drink it down and experience a crazy high (whee! cleaning! writing! FLYING!) and then, a horrible crash (boooooh! cranky! tired! anxious!). So not fun. Now I know to center my juice around low-sugar, high-water veggies like cucumber and celery. I always add plenty of greens, and just a little fruit for flavor. A single carrot, the juice of one lemon – that’s all it really needs. 2) Drinking Too Much At Once: Following from above, this is also about managing blood sugar. The first time I made juice, I was so excited. I took out every fruit and veggie in my fridge, lined them all up, and fed them into my Champion. I made over a quart of juice and guzzled it all in under 15 minutes. Well! I was flying high for about an hour, and then I crashed so hard I nearly took the house down with me. I finally figured out that with juice, a little goes a long way. Now, I only ever take about 8 oz at a time. Sometimes a little more, sometimes a little less, and I drink it slowly. Your own experience will depend on how your body deals with sugar, but it’s good to be mindful – especially at first. 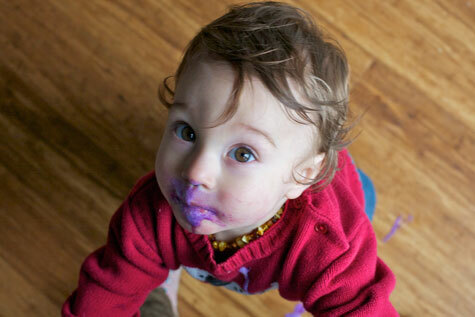 3) “It’s Too Much To Clean Up.” Oh yeah, I’m looking at me here. Guilty! My dear Champion spent over a year (!!!) gathering dust on the counter top, because after the first time I used it, I was like “dang, what a PITA, so much work, grrr graw grumble grumble.” Okay yes, juicers require a little maintenance. They generally need to be cleaned right away, lest you end up with caked and sticky bits. But you know what? It’s less than ten minutes! Now I make my juice and I drink it while I’m washing up. While Waits plays at my feet. And honestly, after I’d done it a few times I realized it’s not so bad. You don’t need to use soap or even a sponge – just rinse under hot water. Toss in the dishwasher once a week (Or don’t. I don’t.) But for goodness sake, you can make the time. Don’t let five minutes stand between you and so much good health! 4) “I Don’t Have A Juicer.” No worries – I got you covered! Done and Done. Next . . .
5) You Make “Everything-But-The-Kitchen-Sink” Juice: I have to admit something. In life and in the kitchen, I’m sort of a compulsive maximalist. And it’s strange, because I actually most enjoy a minimal aesthetic – minimalist design, absolute “un-clutter” in my space, and simple fresh food. But still, I find myself compelled to add add add, and in juicing as in life, it got me into trouble. My first homemade blend was a crazy watermelon-cucumber-celery-cilantro-carrot-lemon-sangria-stiletto-amaretto concoction. Or something. It was crazy! And it tasted just as confusing. But since then I’ve learned that, while juicing is an excellent way to clear out the crisper, a little editing is essential. I advise new juicers to aim for three ingredients or less. Plus maybe a squeeze of citrus. This goal will also help you to manage quantity (see #2), but mostly it’s for flavors sake. Be nice to your tongue, and go easy on the combos. I hope that these little tips will help you to see juicing as something that can easily become a part of your life. It’s enhanced my health so much, it truly is amazing. And summer’s right around the corner with all the best and freshest juice that’s yours for the taking! Thank you! As you know from my frantic tweet the other day, I fell victim to some of the above blunders and paid for it. I’m excited to try again this week with some guidelines this time! Alright you’ve convinced me, time to start juicing. Today is my 31st birthday and I’ve been wanting to “green” up my routine a bit more, might as well start with some fresh juice. Going to try a carrot, celery, apple mix. Wish me luck! (I’ll be tying the food processor method). “No worries I got you covered” didn’t take me anywhere? These are all great points! I do want to add, though, that there are times when pushing the boundaries of points #1 & 2 is beneficial. This may only apply to a few people (or maybe all of you! I have no idea…), but if you’re drinking green juice or a green smoothie for recovery after a high-intensity or endurance event (a 10-miler, for example) then you need a bit more sugar – and calories – to replenish those glycogen stores. After one of my training runs I cram my blender two thirds full of dark leafy greens, then throw in a small handful of berries and a small chunk of tropical fruit. I add some protein-rich alt milk or yogurt (and hemp protein powder) and blend the heck out of it until it’s completely liquefied, and it makes the perfect recovery meal. On the occasions when I drink green juice and haven’t just worked out, I’ve definitely fallen victim to too much sugar! Anyone else having trouble with the link on #4? I was going to make my juice right after I commented earlier but have not gotten around to it yet (what in the heck have I been doing this morning!?!) Anyway, I remembered that I have some beet greens in the fridge leftover from making natural egg dyes this past weekend, maybe I oughta use those in my juice, what do you suggest I pair them with? Ok, spit out your secret! How in the world do you get juices with such bright colors? Last time I did mine it turned out a brown orangeish liquid, not the beautiful awesome green or superb looking purple on the pics you post… they almost look smoothie-ish! mine looked watery (and not as tasty as yours look T_T). I’ll try this combo next. I too want to drink that purple concoction of pure joy. Oh, now that Monika mentions it.. I also like the idea of a ‘recovery’ smoothie! @ sayward – what made this awesome purple!?! Cabbage juice??? I don’t know about this! I am guilty of #1 but I mostly make fruit smoothies not juice. Note to self: Add more veggies. I will try the cabbage, now I am curious! I am inspired to pull out that Jack LeLane from the closet. Tomorrow we drink juice. I’m waiting for my juicer to come in the mail and sooo excited to get this cabbage juice regimen going. Sayward, some of the “juice books” I’ve read recommend no more than 8 oz a day.. at least for obtaining the greatest medical benefit of the juice. And they also recommend not using high fast blenders/cuisinarts/cheaper juicers because the heat can destroy the healing enzymes. Then again.. I’m doing this for medicinal properties and not just for enjoyment. Thoughts on this? And on your busy rush-out-the-door mornings, do you juice the night before and drink the next morning? @ Katie – I let my juicer gather a lot of dust too. Good luck with getting that baby working for you. @Soapwalla Chef – Let me know how it goes this week! @ Lauren – Oh what a wonderful birthday resolution. And HAPPY BIRTHDAY, hope it was an excellent one! Beet greens would be great, they’ll work like any bitter green (ie kale) so you’ll want to put them with something juicy (like cucumber) and then something strong (like apple, lemon, etc). Maybe a little ginger for kick? @ Nina & Brandy – Fixed! Thanks for the heads up. @ Monika – Yes! The blood sugar stuff is tricky and will totally depend on each person’s unique physiology and their situation. For me I’ve found that the healthier I eat, the more sensitive I am to blood sugar spikes. @ Adrienne Audrey – Cabbage, both green and red, has become my very favorite juice. It’s sweet! Annie – Yay, good luck! I juiced for the first time this morning under your tips with the food processor! Just enjoyed a chinesse cabbage and cucumber concotion and am loving the energy! Every time I read one of your posts I get SO inspired! Thanks for putting in all the research and time to pass along these gems…love it! Thanks so much for this! I can’t wait to start juicing. Now on to read your #4, because that’s my problem! Thanks for the great feedback everyone! And @ Rebecca, yay! So glad it worked so well for you! Thank you so so much for this!! I’ve wanted to try juicing out for ages, but assumed that I couldn’t until I could afford a juicer. And now, thanks to you, I know better! I’ve been using my blender and then a tea strainer and it’s worked great. So far it’s been a green, pink lady apple, cucumber and the juice of a lemon. I’m inspired to try more combos out for sure. I even made my mom a juice for mother’s day. While I’m here I just wanted to thank you for all the time and energy you put into your website. I’ve been a long-time follower although I’ve never commented. I always enjoy your informative, smart, honest and real posts. Hopefully soon I will be in a place where I can give a little donation. Keep up the fantastic work!! I’ve been making juice (with my food processor!) for a few weeks now after reading your posts about it… but I have a few questions that I can’t seem to resolve with online research. Maybe you can help. 1) I put my juice directly in the fridge after making it and I wait until it’s chilled to drink it because I like it really cold. Am I losing some of the nutrition by not drinking it right away? 2) When I search for health benefits of green juice, most of the results are about cleansing and detoxing which is NOT what I want to be doing right now (I’m pregnant and soon to be breastfeeding). I guess it’s OK to supplement my normal diet with green juice, but should I worry about not getting enough fiber or calories? In other words, are there any negatives to drinking green juice? @ Lauren – Yay for using your food processor! Technically, you are losing nutrients by waiting to drink your juice. BUT, the amount is probably negligible. What you want to avoid is oxidation, or exposure to the air. So if you can juice directly into your glass, that is good. When you move it from the counter to the fridge try to slosh it around as little as possible. Basically, you just want to minimize air exposure! There shouldn’t be any negatives as long as you were eating pretty healthy before, and you’re adding juice as a supplemental. If you’re going from a McDonalds based diet to a juice fast or something, then you’ll kick off a detox and you don’t want to detox while pregnant! You shouldn’t have to worry about calories or fiber again, as long as you use juice to add to the diet, as opposed to as a meal replacement or something. Does that make sense? I started juicing and I add lots of greens (kale, broccoli, green peppers, spinach, watercress, cucumber and parsley) as for fruits I always add mango and pineapple along with carrots. I was wondering if that’s too many ingredients? The beauty of juicing is that you can come up with your own blend of ingredients. There’s no solid way to follow only recipes that are mustered up. I also agree that many new juicers tend to lean more into fruits than the greens. This is what cause that energy spike but its very short lived. You need a balance. Juice in the morning for energy and weed it down into vegetables as the day progresses. Again, find you balance and you will be just fine. You rock. Love your attitude! Thanks for the info – I’m a newbie juicer. Oh and the purple haze looks delish. I will try to make. I was juicing spinach which I didn’t pre-cut. I put it in whole including the stems and leaves. It clogged the pulp outlet (where all crushed pulp comes out) of my Hurom HU-100 that there was liquid buildup so I had to dis-assemble and clean it up. Moral of the story, if you’re using a vertical auger juicer like mine, pre-cut fibrous greens like spinach and celery into shorter bit-sized pieces so it won’t clog. If you’re using a horizontal auger juicer then no pre-cutting is needed. I really like this article! I was finding myself crashing an hour or two after my juice and getting frustrated but I think I’m sensitive to changes in my sugar too. I’m going to look up low sugar fruits and vegetables and hopefully figure this thing out and keep the combinations to a minimum as to not confuse my taste buds and gag! Thank you so much! i just made juice for the first time……………….WHY DO I FEEL HIGH?!! Hi Sayward!! What juicer do you use? Do you think it matters if it’s a cold press juicer or not? Thanks! Hi Emily, I use a Champion masticating juicer. I think everyone should buy the best juicer they can afford, but that the bottom line is that juicing is good for you! So if you can’t afford top-of-the-line, don’t let it stop you. It’s not necessary. Hope that helps!